Pink Posh Package - monemades Webseite! So, the postie had a lovely surprise for me today - he brought the pink package from Posh Yarn with the prize I won in the Posh Sock Challenge. 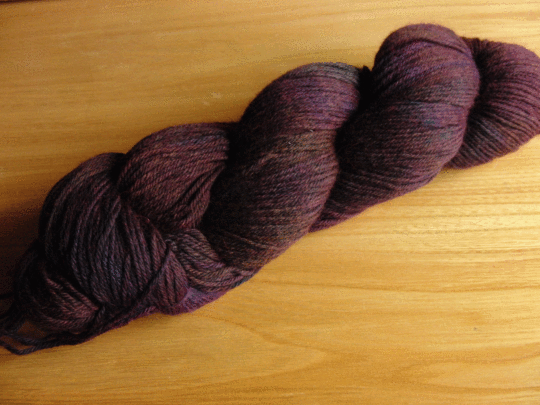 An oh-so-soft skein of Martha Sock in a beautiful colourway! Out of my normal 'colour comfort zone', but sooo pretty. Looks 'winterish' to me. Funnily enough it made me think of marzipan right away, lol, probably because DH eats chocolate thingies with marzipan centre that come in a purple wrapper. It hasn’t told me yet what it wants to be - okay, it told me it wants to be sock, but the pattern? Hm… I think it whispers something like ‘cables’, but we’ll see what’s going to happen when I cast on. :) Thanks again, Dee and Tony, for this wonderful prize!